God not only wants to heal people, He longs for us to be in good health and prosper, even as our souls prosper. Fit For Life Forever is a gateway for Christians wanting to learn, practically, how to honour God with our bodies. Here a team of health professionals and a Christian teacher – each with a passion to see Christians living in optimum health – share their expertise, in a non-judgemental and caring way, to help individuals and church communities function at the highest possible level. Some people hold back from getting fit because they feel self-conscious about their ability or body and want to find an activity they can do on their own, but organised classes and sports clubs can provide you with much-needed support and motivation, as well as a chance to make new friends. Others feel too busy to take on a fitness activity, yet changing your social and eating habits can be a simple way to promote healthy lifestyle changes. Good health is so critical in so many areas of our lives – our state of health determines how much energy we have to work, to serve God and others and to enjoy our friends, family and our world. If our health deteriorates then we rapidly find that many other areas of our life deteriorate along with it. God has created us to be body, soul and spirit and the Bible reveals God’s will for us in all of these areas. Sometimes we have limitations beyond our control, but generally speaking the healthier we are in body the better we are equipped to fulfil our calling. Therefore let God’s Word dwell inn you richly that it might strengthen your faith and discipline your life. What does food mean to you? Is it just fuel? Is it a source of nutrients? Is it an addiction? Is it a guilty pleasure? Is it just guilt? Here at Fit for Life Forever we believe that enjoying good food is one of life’s ultimate pleasures and the huge variety of wonderful foods available to us is a demonstration of God’s extravagant love for his people. Being overweight or obese can present a serious threat to our health. In regard to our relationship with food God wants to empower so that we overcome our unhelpful thinking and are set free from the emotional attachments which could cause us to eat inappropriately. He wants us to have a ‘Spirit-controlled’ appetite. “Fit for the King” is a Biblically based healthy living group study resource for Christians. Drawing on the individual expertise of the Fit for Life Forever team, this course will help you to apply spiritual principles to your lifestyle, and help you practically to achieve optimum health, optimum nutrition and optimum fitness. 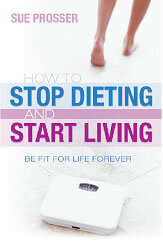 “How to Stop Dieting – Start Living” reveals why diets don’t usually work. Looking at spiritual factors as well as physical and emotional ones, Sue Prosser gently encourages us to understand the reasons why we see ourselves as we do.